*Special Effects makeup* and AIRBRUSH!!! My job is my passion. With 8 years of experience I will provide you with excellent service. 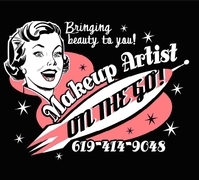 View my website www.makeupartistonthego.com for photos, magazines my work has been featured in , and client testimonials. I am getting married in August, 2010. I had been looking for a makeup artist for my engagement photos and for my wedding, since I am horrible with makeup. I had read that the airbrush makeup is much better than traditional makeup, so I did a google search for a makeup artist. There were a few that looked good, but they were so expensive. I didn't want to spend $1,000 just on makeup for myself and my three bridesmaids. I then found Kirsten's website and sent an email inquiry. She did the airbrush makeup and her price is very reasonable. I also like the photos she had on her website. Everyone looked amazing and natural. That is exactly was I was looking for. I had quickly signed up for her to do my makeup for my engagement shoot. Let me just say this, she is beyond talented. I stupidly decided to try the spray tan right before my engagement shoot. I told the lady at the tanning place that I just needed a light tan just to get rid of the tan lines. I didn't want to be too dark. Of course, I come out looking orange. Kirsten was so amazing with my makeup. She took out most of the orange and I looked great for my photos. My photographer asked me if I had done my makeup and I told her that I had a makeup artist do my makeup. She told me that I better book my makeup artist for my wedding because she said my makeup was fantastic, especially in the photos. I am so happy to have her doing my makeup on my wedding day. If you are looking for amazing talent and at a decent price then you NEED to book her! I had been looking for a makeup artist for my engagement photos and for my wedding, since I am horrible with makeup. I had read that the airbrush makeup is much better than traditional makeup, so I did a google search for a makeup artist. There were a few that looked good, but they were so expensive. I didn't want to spend $1,000 just on makeup for myself and my three bridesmaids. I then found Kirsten's website and sent an email inquiry. She did the airbrush makeup and her price is very reasonable. I also like the photos she had on her website. Everyone looked amazing and natural. That is exactly was I was looking for. I had quickly signed up for her to do my makeup for my engagement shoot. Let me just say this, she is beyond talented. I stupidly decided to try the spray tan right before my engagement shoot. I told the lady at the tanning place that I just needed a light tan just to get rid of the tan lines. I didn't want to be too dark. Of course, I come out looking orange. Kirsten was so amazing with my makeup. She took out most of the orange and I looked great for my photos. My photographer asked me if I had done my makeup and I told her that I had a makeup artist do my makeup. She told me that I better book my makeup artist for my wedding because she said my makeup was fantastic, especially in the photos. The wedding day makeup was even better! I also used her friend Jamie to do my hair. They were fun and have 5 people done with their hair and makeup in 2.5 hours. Everyone looked so good and the pictures were wonderful. I loved what they did to my mom. She never wears makeup or pampers herself and she looked so beautiful.